KUPWARA/PULWAMA, March 23: District Tuberculosis Officer (DTO) Dr Mohammad Ramzan today flagged off a rally of school children from District Hospital Kupwara, on the eve of World Tuberculosis Day. Later a function was held at AMT school in which Immunization Officer Dr Davindar Kour, BMO Kralpora Dr Mir Shafi, BMO Trehgam Dr Nissar, District Mass Immunization Officer Gh Rasool Bhat, Dr Mohd Ayoob Wani, students, para medical staff, members of civil society, ASHA workers, besides members of J&K Youth Welfare Society Trehgam Kupwara participated. The speakers laid stress on early detection and control of TB. At the conclusion of the function, District Tuberculosis Officer Dr Mohammad Ramzan Wani thanked all the guests and said that TB is a completely curable disease, provided the patients follow the medical advice strictly. 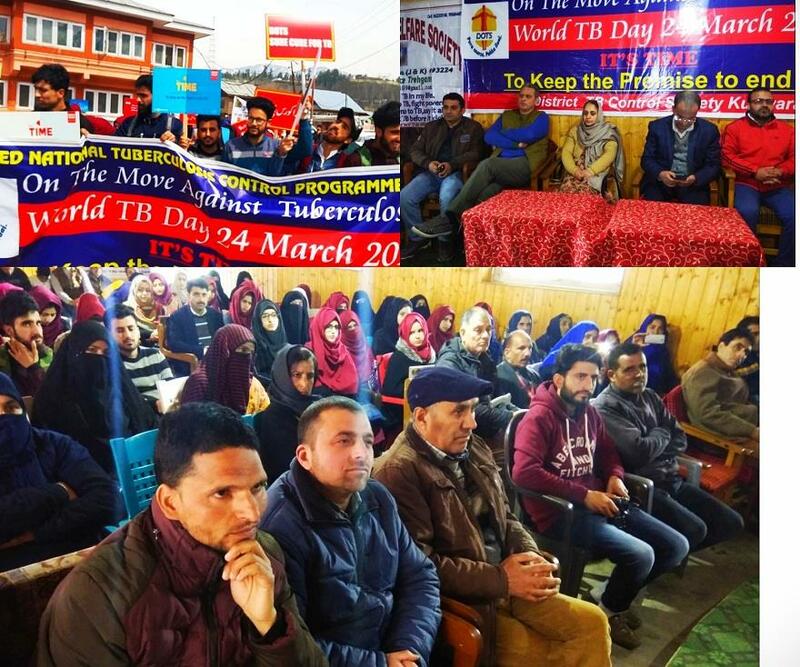 The similar function was also organized at Pulwama by the District TB Control Society Pulwama under the aegis of Directorate of Health services Kashmir today observed World Tuberculosis (TB) day in district Hospital here at Pulwama. District Development Commissioner Pulwama, Dr Syed Abid Rashid, was the chief guest on the occasion. At the occasion, DDC said that Tuberculosis is one of the world’s deadliest diseases and it is time to adopt the strategy for its elimination which involves implementation of interventions, additional to standard TB control measures such as RNTCP. He added that the threat of Multi Drug Resistance arising out of TB medication should be checked and ITC methodology should be adopted to create awareness about this menace. He stressed on the need to create awareness about the symptoms, precautions and treatment to eliminate the disease from the society. He stressed upon the health officials to conduct a survey in far-flung areas of the district and create awareness among the common people about the disease. He lauded the role of ASHA and health workers who motivate people to seek medical advice if they experience any associated symptoms of the disease. On the occasion, various speakers and students from different paramedical institutions and schools threw light on the tuberculosis scenario in the district and state. They highlighted the importance of timely diagnosis and awareness to eradicate the deadly disease. Chief Medical officer, Dy CMO, Principal GNM School, Block Medical officers, District Tuberculosis Officer, Health officials, Asha Workers and large no. of students of various schools and Para medical Institutions were present on the occasion.